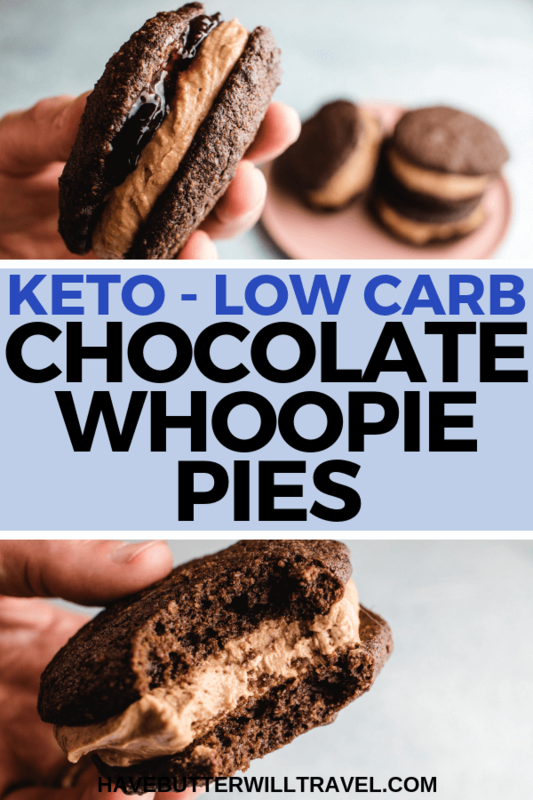 As this keto whoopie pie uses the 180 Cakes Chocolate Cake mix from Low Carb Emporium it is the easiest keto whoopie pie recipe you will find! 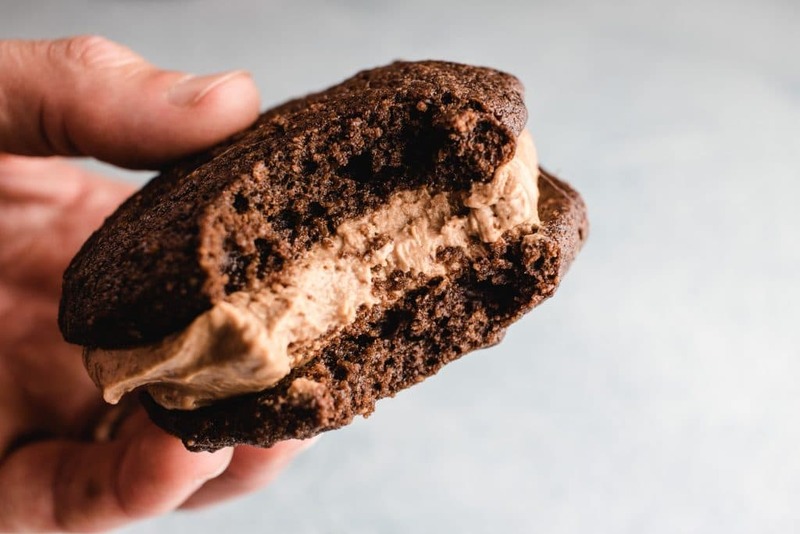 A word of warning these keto chocolate whoopie pies are addictive. Whilst recipe testing, Dan consumed way more than she should have. That is usually a good indication that we are onto a winning recipe. Whoopie pies are a cross between a cake and a cookie with a frosting filling. It uses two cake discs and a cream cheese frosting to form a cake cookie sandwich. What’s not to love about cake with frosting in a cookie sandwich form? Whoopie pies originated in the New England region of the United States and have started to gain some popularity around the US. We had both heard of them, but have not really seen them in Australia much. When recipe testing we often give some to our friends, as we want to make sure the recipe is as good as we think it is. None of our friends had heard of whoopie pies before and were pretty dubious about what they were about to eat. Well, let’s just say that whoopie pies are now on their radar when looking for a sweet treat. 180 Cakes is an Australian company based out of Western Australia. Kara began the company 2017 and she makes excellent baked good mixes using xylitol as the sweetener. We first fell in love with these mixes when we bought our first chocolate cake mix from Low Carb Emporium. 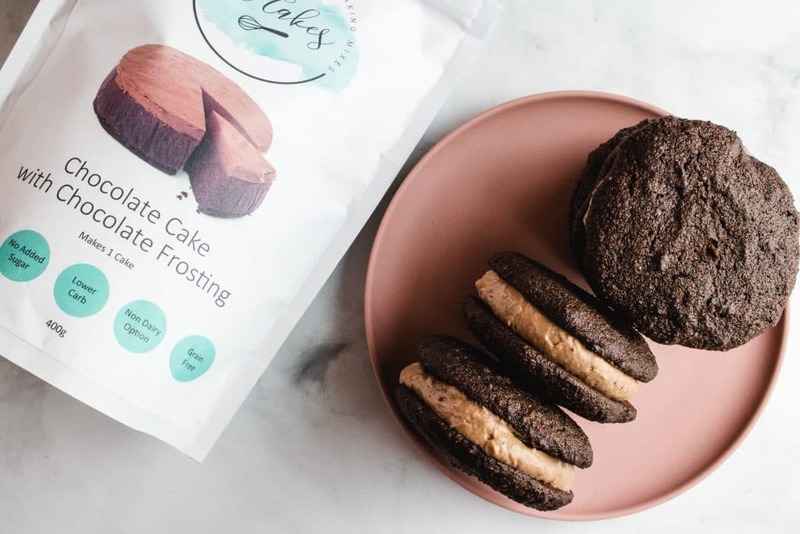 Erika wanted to use the 180 Cakes Chocolate Cake mix to try and create a keto whoopie pie. One of the best things about this recipe is how easy it is to make. 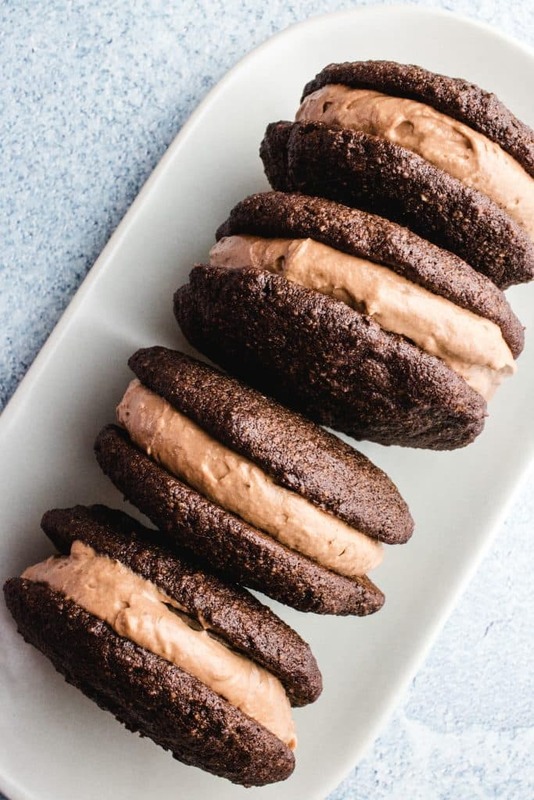 Simply order your 180 Cakes Chocolate Cake mix from Low carb Emporium and you will have the main things you will need to make these keto whoopie pies. All the other ingredients are staples in most keto kitchens, butter, eggs, cream cheese and pure cream. We have used these delicious 180 Cake Chocolate Cake mix before in our Black Forest Trifle. This trifle is a perfect dessert for a celebration like Christmas, a birthday party or a family get together. When dividing the cake mixture onto the tray, you will want to shape each cake into a small disc. The cake mixture will spread slightly whilst cooking so make sure to leave enough space between each cake disc. Before assembling the keto whoopie pies, make sure the cakes are completely cooled to avoid the filling from melting. If using extra fillings like jam or nut butters, it’s easier to place the icing on one cake disc and the additional filling on the other cake disc and sandwich them together. The 180 Cakes Chocolate Cake with frosting mix is currently only available in Australia. If you are unable to access the 180 Cakes mixes we suggest using the Good Dees chocolate cake mix using the three eggs method on the pack. 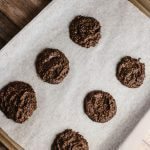 You can also make your own cream cheese filling using this great chocolate cream cheese frosting recipe from Ditch the Carbs. While we were recipe testing these keto whoopie pies, we decided to experiment a little with the fillings. These are delicious with just the cream cheese filling in the middle, but if you want to get creative try adding some jam or nut butter. We added some Hawthorn hill farms sugar free cherry jam to one of ours and it was an extremely tasty addition. You could also add your favourite nut butter as well. These keto whoopie pies are so easy to make and absolutely delicious to eat. The chocolate cake is rich and chocolatey and the chocolate cream cheese filling is so smooth, creamy and delicious. 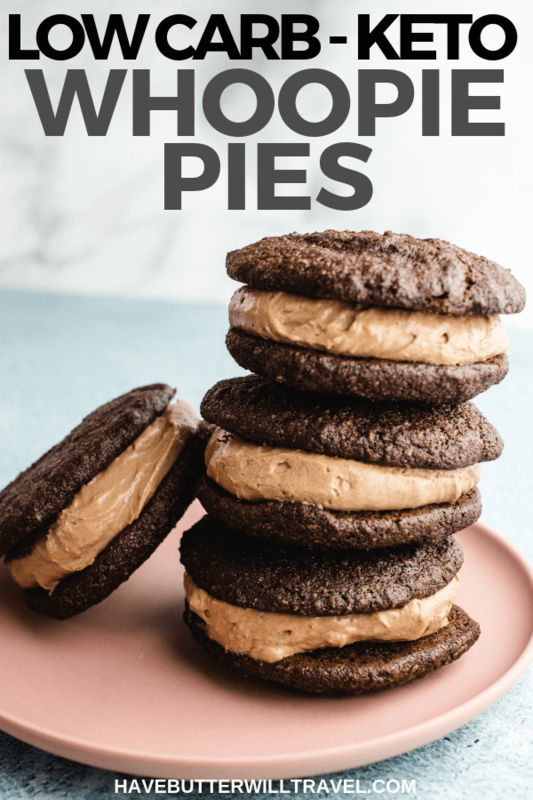 If you have never heard of whoopie pies, give these keto whoopie pies a try. You definitely won’t be disappointed. 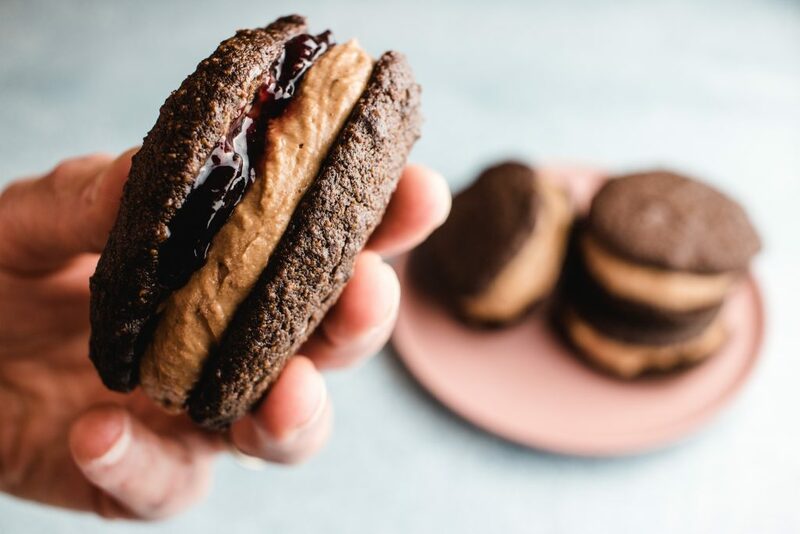 This keto whoopie pie recipe is the perfect sweet treat to take to a family gathering or a BBQ with friends. If you are always looking for recipes that will also suit the non keto palate, make sure you add these to your list. Please, If you like this recipe, give it a 5 star rating. 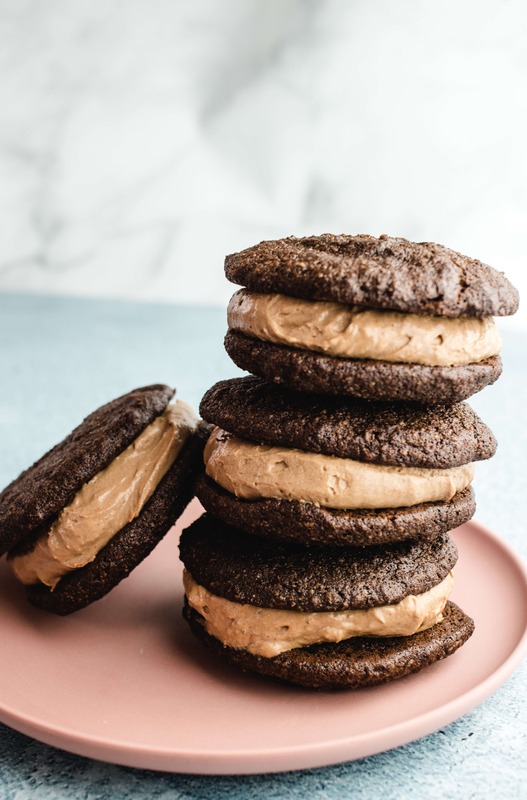 These keto whoopie pies are so easy to make & so delicious you will find it hard to only eat one. The chocolate flavour in this low carb dessert is perfect. Spoon approximately 1.5 tablespoons of mixture onto the baking tray and slightly spread out. Repeat until you have 16 even cakes. They will spread slightly during baking so leave space in between. You may need to cook half at a time. Bake in the oven for 15 minutes or until firm to the touch. In a medium sized bowl, beat the cream cheese and the icing mix together until smooth and completely combined. Add cream to mixture and beat for a further 1-2 minutes, until cream is completely mixed through. Once cakes are completely cool, divide the filling mixture evenly between 8 of the cake discs and spread evenly to the edges. If you are planning on adding extra fillings, add them to the other 8 cake discs. Place the cake discs that don’t have the cream cheese filling on them, on top of the cream cheese filled cake discs and lightly sandwich them together. These will store in an air tight container in the fridge for 2-3 days.